The post is entitled The Harsh Truth About Bugging Out of Cities, and long-time readers may recognize it as a synopsis of a three-part series written by Don back in June. The problem is we don't know what the disaster will look like. The whole electricity grid going down meme is a favorite but I think it is a red herring put out by people who have no clue about electric generation and distribution. The far more likely and more disastrous problem is some large natural disaster or some large manmade disaster (such as a nuclear war). Even more likely is a less disastrous event like a great depression, civil unrest, a massive immigration disaster somewhat like what Europe is experiencing today, etc. The problem as I see it is we don't know and cannot know what the disaster will look like and whether or not it will cause millions to leave the cities or just roving gangs to leave the cities or if it will be our own government that we fear. I think a likely scenario is some kind of disaster followed by years of ineffective governing and mounting pressure and people suffering and dying and pure human desperation. This may be economic based or energy based or the result of 20 million immigrants/refugees rushing our borders, etc. Whatever it is I think the key will be the TIME not the degree of the problem. That is it could go on for decades and your enemy could be day after day of poor, starving people who don't confront you but steal from you in the night for years and years. The problem will wear you down to nothing. I agree that all eight or so situations you listed are feasible. 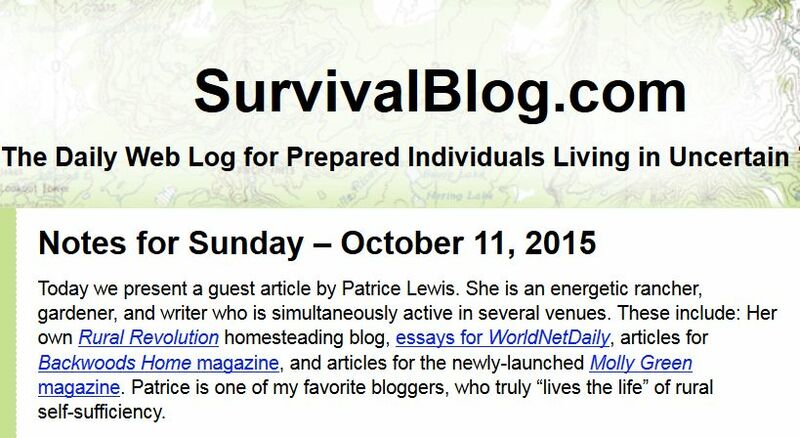 Are you saying that preparing for survival is hopeless? If not, what actions would you recommend that city dwellers take? I am not saying preparing is hopeless in fact I believe in preparing for the worst. Make your plan more broad and less focused. Plan for the marathon not just the sprint. Have alternatives A,B,C...Z because no matter what you plan for it will either be different or change as the crisis evolves. I don't know what the future holds, I admit that. What I'm saying is no one knows what the future holds for us. I am skeptical of the EMP scenario which has become a favorite of preppers. It's too perfect, it compliments the preppers plans and goals and therefore proves them right. Too pat. It won't go like that. More than likely what will happen is we will be nuked either totally destroyed or all/most large cities. Maybe it will be an asteroid, maybe it will be another great depression. More than likely whatever the great disaster is it will go one for 20 years or more. Possibly most Americans, including preppers will be killed either outright or over time. Possibly our society will be destroyed and China will send boat after boat of their military and non-military over to occupy us. Maybe an enemy will attack South and Central American forcing tens of millions of refugees streaming across our Southern borders. I would expect that whatever happens the problems will evolve over time in such a way that you may well do stupid things in the beginning of the crisis that you will come to regret a year or two into the crisis. For this reason I suggest preparing "heavily" and using those preps sparingly. Think long term, protect your assets, have a plan B (& C, D, etc). I hope nothing happens but I fear in the next few years something terrible will happen and our country will not survive it. Our leaders are afraid and unwilling to act or act correctly so when TSHTF I fully expect them to do the wrong things for political reasons thus making it all worse. They will lie to us and this will encourage us to delay acting or to not immediately act in our own interests. In my humble opinion the worst thing we can do is try to continue to live normally which will really mean using/wasting our resources because we think the crisis is short term. The only thing I can add is move to a small city, 50,000 or less, move far from a big city especially a city with a lot of thugs. Create family ties and connections, plan alternative solutions, store food/supplies in multiple locations. Wow. That article is certainly worthy of such an honor. Congratulations Don and Patrice. 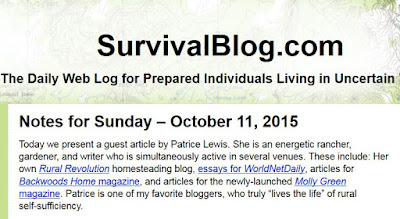 Pat, thanks for the great article on Survivalblog.com today. I respectfully disagree with parts of the well written and thoughtful article. Preppers will be drastically outnumbered and probably outgunned by marauding groups who will care little about losses while trying to raid people who can ill afford ANY losses. They won't stop to bury their dead or lick their wounds they will just move on to the next target. No mention either of the very REAL possibility of government confiscation of prepper's supplies 'for the greater good'. Any thoughts about that possibility? Well, sorry to burst the bubble but that dog don't hunt. First, not many of us, not many at all, live out in the boonies. That would be an enormous advantage, but a luxury most of us just don't have. When I walk out my front door facing north, San Antonio is about 120 miles to the Northwest, Houston is about 120 miles to the Northeast, Corpus Christi is less than 100 miles to my back, and HWY 59, a major four lane highway runs smack through my hometown. 59 also connects us with Mexico and will be bumper to bumper with drug cartel vehicles with occupants hanging off the sides shooting at anything that moves. There won't be so much as a wet spot left of the inhabitants here, rather they resist or not. Furthermore, look at the population density of this country. 90% of the people live in less than 150 counties nationwide. How is anyone on the east coast from Miami to Vermont, or the South, or the Midwest going to escape the Golden Horde. They can't, and believe me it is not overrated. I am very disappointed in this article, and it will be responsible for the deaths of many if they take your words seriously. The article, in its entirety is absurd. Rethink this issue please. I am seriously resisting the urge to snark this comment. 8:51 PM Anon - there is no freakin' way that I'd be living anywhere near the Mexican border if I thought that one of these doomsday scenarios was a possibility. Do you think that one of these SHTF scenarios may occur in your lifetime? If so, what's your plan? Instead of Patrice rethinking her position, by your own description of where you live, it appears you should rethink your physical position. I'm confused by your disappointment in the article just because you happen to be living in an urban area. Did you want the article written so you easily survive? How does this article endanger you? How is it absurd? It is a hypothetical situation addressed in the framework of known facts about urban demographics and the human tendency to prove "an object at rest, tends to stay at rest". I think a few of us would truly like to read a response that tells us why you think the article is absurd. Sometimes, the devil's advocate does help understanding. Sincerely, I don't need anyone to help me survive, at least as far as this article goes. Do I have to explain to you that it is absurd to think for one moment that any rural dweller will not be attacked and killed, no matter their distance from the cities? And also, the article doesn't endanger me, because I have better judgement than to listen to it. I have a bol, and after my supplies run low, you can rest assured that I'll be one of the ones going through the countryside doing whatever it takes to survive. Consider the population of Phoenix, 3,000,000+: If only 10% survive getting out of town, that is 300,000+ that the farmers and ranchers have to contend with. Guaranteed, one farmhouse/ranch-house at a time, the rural population will fall. Keep in mind that this is one city in one state only. Anybody, and I mean anybody that doesn't get somewhere and hide out for at least 90 days is dead. So instead of ridiculing me, why not look at the numbers? They never lie, and they bode no good for those thinking they will be safe in an isolated area: Unless they are laying low and unobserved. The odds of you winning the mega lottery are probably better than the odds of the Golden Horde or remnants thereof not showing up at your front door. Respectfully, consider these facts before making a very bad decision. thanks for your time. A situation that would produce a "Golden Horde" would tend to be rather sudden, and many city dwellers would tend to adopt a wait-and-see position for a week or two. By the time that most decide to head for the hills, the more feral city residents will have already set up roadblocks, etc. to strip most possessions from those trying to flee. I think that the city and its outskirts will be the real killing fields. your article is quite good Pat ! and it made several alternative media sites !! keep up the great work! Heh. The younger generation cannot navigate without a phone. They don't know how to read maps. We found this out when we were going to a rural Georgia reunion, and were called by a young family member that was also going. They told us they dropped their phone and didn't know how to get there. Great, post! Hard-hitting and eye opening. I just wish more folks would band together...but I guess that's Pollyanna, thinking..... In my rural neighborhood alone, after a weekend of parties, traffic, teens running around on 4 wheelers, raising h*ll...... I'm thankful, to have survived, just that, (much less a more serious event)! Lord, have mercy, on us. Good article. I remember reading the original and many family discussions came from it. I agree with your conclusions, but the reading and comments this time has made me think there probably more than one scenario with the Horde could happen. We live in a semi-rural area where the dream for years was 5 acres in the country. It was to the point that these became a new way to show off with big house, big vehicles, kids on dirt bikes and quads racing around their own race course on their land and guns in the hands of these same people. People trying to create a place to raise some food were priced out or realized these weren't a good place to quietly do their business. This is the Horde I had never really thought about. Thank you for opening my eyes. Holy Batman! Patrice, now your article is going to be "responsible for the deaths of many"? You know, like guns held responsible for the deaths of many. Make a lot of sense, to city dwellers. I agree with charlie Mitchell as to the city dwellers but nobody really mentions the locals who need assistance. Any rural are has small towns scattered everywhere as well as the county seat which is perhaps a couple of thousand people. Few of these people will be able to ride out a long term problem. Who's going to feed them? Patrice and her neighbors? I doubt if they have the resources. What then? As nice as the people living around Patrice are, I know of no father who would not do whatever it took to keep his family from dying. Eventually that will include taking Patrice's and her neighbor's resources- one way or another. Many folks set aside food for charity. That said, facing cold, tired and hungry families, especially those you know, will take God's guidance. I have no good answer other than to pray for guidance. Loren, to you and me it seems an absolute that fathers will do whatever it takes to protect and save their children. But time and time again you read comments from people not doing that. Oh sure, they give you all kinds of reasons to justify their failure to set priorities and take action. Let's take Phoenix with its 3 million people, since it has been mentioned here. Let's say 20% are fathers, that 600,000. Let's say that just 10% believe that civilization as we know it will likely fail soon with hundreds of thousands, possibly millions of deaths. That is 60,000 fathers who make the decision that their children remain living in a city of 3 million people. I know REAL fathers. These males are NOT real fathers. If that offends anyone, I really don’t care. As a father, I will continue to speak out against poor fathers, and continue praying for the loved ones depending upon them for protection. If this is the harsh truth about bugging out of the city, what is the alternative, staying put and how to prepare for that? Oh my goodness, I loved this post!!! I shared it with my husband and folks from church. Let me say that Don is so right. We live in a tiny community busy with nothing but one post office and lots of farming and we love the quiet and the seclusion. What's amazing is when we have to go into the big city people there have no clue where our community is. They don't even know larger towns just 15 miles outside their city. It's as though they only seem to know where the shopping, dining and their apartment/house is and that they can find using their smartphone. Then we realized how many of the city folks are pouring in from California and northern states with big cities and so not only do they not know the area around their city they don't even know the very city they live in. So you can imagine what is going to happen when it all falls apart in the middle of summer here in TX and the few folks who try to get out are trying to stumble down black asphalt roads in 110 degree heat daytime and 90 degree heat at night with no water, no food and no protection. Not to mention how we in the south are known for our obesity. Oh and their cell service doesn't work. Our state is pretty big and when people ask how far a place is we state our answer in the time it takes to drive there not in miles. So imagine being on foot. Yeah I'm guessing it's not going to be very pretty. Folks please listen up and get out now before it's too late. Thanks to Don his wonderful response and insights. Take care. Just wanted to say sorry for my heated comment to the anonymous poster from Texas. I understand why it wasn't approved but it expresses the frustration my family and I have with regards to what is happening to our beloved state. You would not believe the demographic change that has taken place since I was a child.... I'm a fourth generation Texan so you can imagine the change since my family settled here. People like him do not embody the spirit by which most rural Texans life by. The urbanites are slowly turning our state into California. It saddens me. Which is why we are considering a move to the redoubt area. I have never lived north of the Red River or in a city larger than 10k (college) mainly just living in farm communities. So I'm nervous about the change. Would you ever consider writing a post about moving to Idaho? Perhaps to help like minded folks to understand what to expect and how to adapt. Thank you again for sharing your husband's insight. We thoroughly enjoyed it.